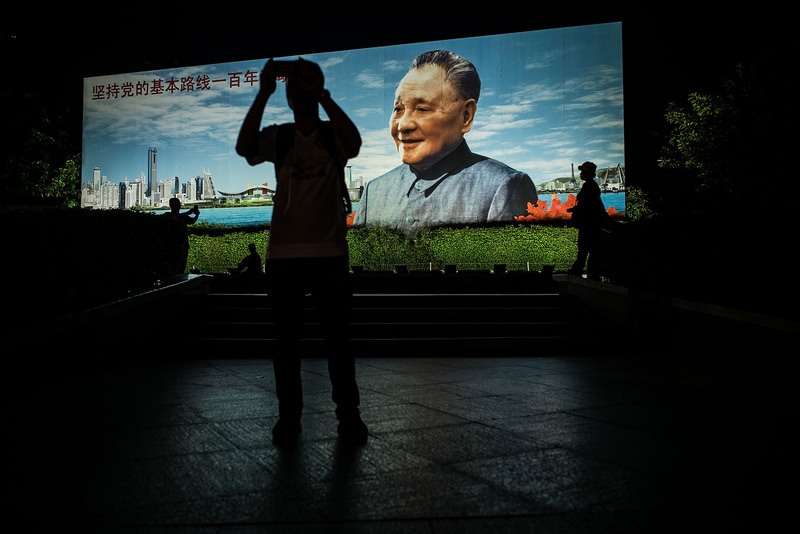 A billboard of Deng Xiaoping, the former Chinese leader, at the Lo Wu border between Hong Kong and mainland China, in Shenzhen, April 3, 2016. It was the worst kept secret in Chinese politics. From 1978 until his death in 1997, Deng Xiaoping was Beijing’s ultimate decider, even though he never held any of the top official titles in this period: not general secretary of the Chinese Communist Party, not president of the People’s Republic of China, not premier of the State Council. The word of “Comrade Xiaoping” remained paramount even after he retired from the Central Committee in 1987. But how did Deng manage to maintain power from behind the curtain after his “retirement”? This question matters urgently for the present moment, as the 19th Party Congress convenes amid heated speculation that Xi Jinping may himself extend his tenure beyond a normal 10-year term as China’s top leader. The arrangement made regarding Deng in 1987 is one possible precedent for Xi’s extending his power after 2022—though a closer look at the history suggests that this would be a highly risky path. In 1987, the 13th Party Congress named Zhao Ziyang the Chinese Communist Party’s general secretary; at the same time, Deng and his generation of gerontocrats—whose continued interference in daily affairs had grown intolerable even to Deng himself—retired from their positions on the Party’s Central Committee. But rumors immediately began swirling that a secret deal had been struck: Deng would remain the paramount leader, and Zhao pledged to consult Deng on matters of importance. On May 16, 1989, Zhao revealed the truth at a televised meeting with Mikhail Gorbachev. Amid the protests that had broken out across China, including the hunger strike students had begun in Tiananmen Square, Zhao told Gorbachev, “a fairly important decision was made [in 1987]—that in all big questions we should turn to [Deng] as to a leader. This decision was not published but I am informing you about it today.” The effect of this public comment was what Zhao, in his memoirs, called “a great misunderstanding,” and the situation rapidly worsened. Deng and his family felt that Zhao had betrayed him, forcing him out from behind the curtain at the moment of maximal risk at the height of the student movement. Deng’s daughter, Deng Nan, evidently vented her rage by subjecting Zhao to an hour-long tirade. Within a few days, Deng approved the decision to impose martial law. Zhao was placed under house arrest soon after and stripped of his position. In less than three weeks, Deng would authorize the violent suppression of the movement on the night of June 3-4, 1989. Yet what, in fact, was this alleged secret protocol? Its existence has been known for many years, not least because of Zhao’s comment to Gorbachev (as well as subsequent descriptions given by Zhao and his aide Bao Tong). But a new trove of documents related to Zhao recently became available, and at last the public has access to the precise text and actual content of the Deng protocol of 1987. We still need Comrade Xiaoping to continue on at the helm at this critical juncture. The Politburo Standing Committee believes that from today on, when we encounter major problems, we still have the need to consult Comrade Xiaoping, and Comrade Xiaoping will still be able to convene our meetings. We earnestly make this request of the plenary meeting and of Comrade Xiaoping, because it is necessary for the cause of our Party, and we trust that the plenary meeting will agree with our request. The document records that Zhao’s announcement was met with “warm applause” by the Central Committee. Despite its informality, this appeared to serve as sufficient ratification. No vote was taken. Zhao stated after the applause: “Good! Our request was warmly endorsed by the plenary meeting, and we view it as an especially meaningful show of support for the Politburo.” And that was that. The arrangement was not based on any official Party rule, nor was it explicitly presented as a great secret. But in May 1989, the effects for Zhao, for the Party, and for most of all for the Chinese people killed and wounded during the June Fourth crackdown were disastrous. It’s important to realize that this protocol isn’t just the stuff of history. As we watch the public fanfare that will surround Xi Jinping’s re-anointment at this week’s Party Congress, the 30-year-old story of the secret protocol reminds us how much of what goes on even at a seemingly public event like a Party Congress is unknown to outsiders. Xi read out a public report, like Zhao and his successors did before him, but whatever internal agreements are governing the country’s elite politics will remain hidden from view. The Deng protocol also underscores that some of the most important decisions in Chinese politics are informal, operating outside of the rules that are supposed to regulate the Party and the government. Both Jiang and his successor, Hu Jintao, retired after two full five-year terms and made way for a successor to take the reins. Still, rumors about the continuing behind-the-scenes influence of former leaders, especially Jiang, have endured. Xi may consider this route if he seeks to continue “at the helm” but not operate in an official capacity: As with Deng before him, when Chinese leaders want to buck the norms and rules of their system, they may choose secret, informal arrangements that are less visible to the outside world. Of course, as we saw with Zhao, the ambiguity inherent in these arrangements also exposes everyone involved to heightened risks. For this reason especially, for Xi to follow Deng’s precedent and become the man behind the curtain seems to be an unwise course. Of course, Xi may not even need to pursue this route. In 2022, he will be 69 years old, more than a decade younger than the octogenarian Deng was in 1987. He also may confront even less internal opposition. Five years ago, when he came to power, analysts were speculating about whether factions associated with his two predecessors (Jiang Zemin and Hu Jintao) would run the table. But those days seem largely in the past. Xi has to balance many interests and certainly encounters staunch opposition and other power centers, but he appears to be succeeding at enforcing direct loyalty to him as the “core” leader. Rather than becoming the man behind the curtain, it seems entirely possible that he will remain the man on the rostrum for a third term or beyond. Either way, the precedent of the Deng protocol of 1987 will inform this most consequential decision.